Ancient Tulum, perched on top of a 12-meter-high cliff overlooking the white sandy beaches of the Caribbean Sea, is the only fortified Mayan town by the coast. Bounded on the landward side by a wall, Tulum is one of the most fascinating ruined cities on the Yucatán Peninsula, thanks to its unique cliff-top position and wall paintings. While not much is known of its past, its name is Mayan for fortification, suggesting it once held military significance. Dating from the Maya Late Post-Classic period after AD 1200, the site's most important buildings were probably not erected until 1450, just 68 years before members of a Spanish expedition became the first Europeans to see the fortification. 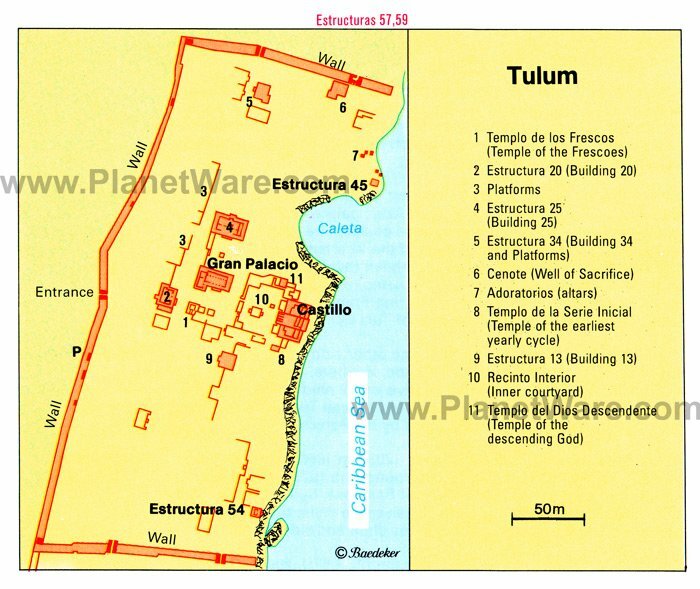 The city appears to have been inhabited right up until 1544, when the Spanish conquered the northeast of Yucatán, and towards the end of the last century, during the Caste War, when Maya Indians again barricaded themselves at Tulum. Perfectly positioned just an hour or so from the resort destinations of Cancún and Playa del Carmen, Tulum is a must-see tourist attraction when visiting the Mayan Riviera. One of the main attractions for tourists visiting Tulum, and one of the features that sets these ruins apart from others in Mexico, is the beautiful stretch of beach below the ruins. A set of stairs leads down to the oceanfront offering a refreshing break from the sun for those who remember to bring their swimwear. The turquoise water lapping against the white sand beach is irresistible on a hot day. The relatively small area occupied by the ruins of Tulum is surrounded on the landward side by a fortified wall, an enclosed area measuring 380 meters by 65 meters. The stone wall itself was originally between three and five meters high and, on average, seven meters wide and contained five exit points protected by stone slabs - features that suggest Tulum also included a dwelling area. A circular walkway protected by a parapet led along the length of the wall, and at each of the two inner corners was a small temple, also used as watchtowers. The most important of Tulum's buildings is the Temple of the Frescoes (Templo de los Frescos, or Edificio 16). Standing in the middle of the walled area on an east-west axis, the building was constructed around 1450 and built over on several occasions. The only ground floor room has an entrance on the west side that is divided up by four columns, above which is a double ledge sectioned off by three niches, the central one containing a stucco sculpture of the God Descending, while the others are decorated with reliefs depicting seated figures with elaborate headdresses. The corners of the ledges consist of large bas-relief masks that were once painted and depict Itzamná, the old Sky God revered by the Yucatán Mayas. Over the door of the upper floor is a niche with the remains of a stucco relief representing the God Descending, and the wall of the interior room is decorated by interesting codex-like paintings depicting other Mayan gods. In the upper section, two representations of Itzamná face one another, flanked by the rain god Chac, while the central part of the frescoes depicts the moon and fertility goddess Ixchel. Also of interest, in front of the temple on an altar, stands a nearly one-and-a-half-meter-high stela bearing a post-Classic Maya calendar for the year 1261. The largest and most striking building on the site is the Castillo (Edificio 1), at the eastern end on the cliff-edge overlooking the sea. Believed built during three separate periods, this large structure is notable for the broad steps leading to a terrace on which the two-roomed temple stands, along with a stone used as an altar for human sacrifices. The entrance to the temple is subdivided by two serpent columns, and in the niche above the central door, a stone figure can be seen representing the God Descending. Directly north of the Castillo is the Temple of the God Descending (Templo del Dios Descendente), erected on top of an older structure and notable for the fact its walls taper downwards, a method of building believed to provide stability. Possessing a single room, the temple's interior includes interesting features such as the niche over the entrance containing a stucco sculpture of the God Descending with wings on its arms and shoulders, as well as a bird's tail. This winged figure has various interpretations, including a swooping bee, the evening star, the setting sun, or even lightning. Also of interest is the Temple of the Initial Series (Templo de la Serie Inicial, Edificio 9) named after a stela found here that was dated as AD 564 and which now resides in the British Museum in London. A variety of bus tours are available for visitors to Tulum from the region's major resort towns, including Cancún and Playa del Carmen, that generally include the services of an English language guide. You can take a Private Tour of Tulum from Canún, which will pick you up at your hotel, take you and your group to the site for a 90-minute guided tour, and return you back to your hotel. Total time for this tour is five hours. Some tours also offer stops at other sites along the way. For those wishing to go it alone, maps and booklets are available from the Visitor Center. Getting to Tulum: Tulum is approximately 130 kilometers from Cancún, 65 kilometers from Playa del Carmen, and is accessible via Highway 307. Visitor Center: Be sure to collect a map and other useful material from the visitor center when purchasing your admission ticket. Food and Drink: A restaurant is located in the visitor center. Climbing: For safety reasons and to protect this historic site, it's no longer possible to climb the ruins. Walking: Be prepared for plenty of walking. It's a one-kilometer walk to the site proper (although an inexpensive shuttle bus is available), and once inside, there's even more walking to do. Wear comfortable walking shoes, along with a wide hat, and plenty of sunscreen. Arrive Early: To avoid the crowds - and the hottest part of the day - try to arrive at opening time, 8am (even earlier for a chance to watch the sun rise). Alternatively, most bus tours leave by mid afternoon, so later in the day is also a good time. Overnight: A number of hotels are close by for those wishing to break their trip up over a couple of days. While there's plenty to keep you occupied during a visit to Tulum - especially if you're just there for the day - it's worth taking the time to explore the local area. A highlight is Tulum Pueblo, the small community that serves the Tulum Ruins, which offers shopping, restaurants, and entertainment. If it's the beach you're after, visit Tulum Playa for its fine stretches of white sand and eco-hotels, restaurants, and spas. A little further afield (some 25 kilometers) is Chunyaxché, another archaeological site with pyramids, temples, and palaces dating from the Late Classic and Post-Classic periods, and a quiet lagoon for swimming.